Say you just sold your first mobile app, or your company just got acquired by some search-engine giant. What’s a car-crazed geek to do? Real estate? Retirement plan? 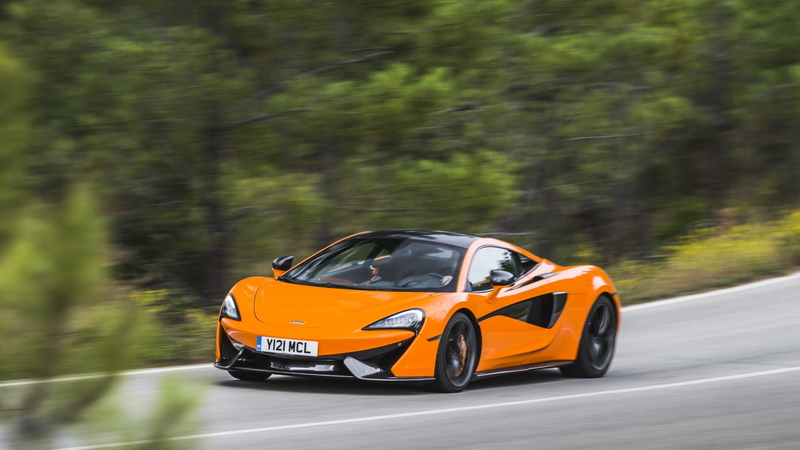 We’d do something totally logical like this--the 570S, the first car in McLaren's more attainable Sports Series. Logical. Yes. In a world where Lamborghini's getting back into SUVs and Ferrari sells an all-wheel-drive kamm-backed four-seater, some things should still ring true, without interference or noise. The tone McLaren strikes is as clear as a bell. It should, since it's the namesake of one of the few drivers to win a Grand Prix, Le Mans, and the Indy 500. It’s still a relative bit player in the Italophile world of supercars. But McLaren as a brand, the 570S as its main parry--they're probably the rudest wake-up call the Italians ever will get, the rudest wake-up call that ever will be delivered by someone or something British. MORE: Know all your McLaren cars? For the engineering purist, the McLaren's carbon-fiber hull, turbocharged powerplant, and its rear-drive, mid-engine layout sound like a blueprint for perfection and fanboy worship. Still, even in the cash-flush reaches of Silicon Valley where McLaren has one of its handful of U.S. dealers, gawkers have to look two, three times before they can identify this winged beast by its minuscule badges. What lands its first visual punch, in this case, is the $4,000 coat of Ventura Orange paint and a pair of articulating doors. The 570S makes a mark on retinas left and right, whether it's standing still or clawing its way around corners on our ascent to Skyline Road, then as we barrel toward the ocean on the swifter passages of Highway 84. After the shock of orange wears off, the 570S sears its way into memory with its unmistakable stance and its utterly distinctive shape. It’s carbon fiber at its core, but wears slinky aluminum outside, pulled tight over the passenger cabin and drivetrain like the skin on a decathlete. Headlights arc in a shape echoed on the key fob, and on the discreet black rectangle that makes up the nose badge. That rectangle might be the only straight-line source on the car, aside from the sills. Every panel is tweaked and tuned for aero in a comely way. Long stalks hold the mirrors away from the body to cut down on drag, and muscular pieces (McLaren likens them to tendons) across the doors shunt air into the mid-engine bay through massive ducts. It’s all flying buttresses, Nike-esque swooshes, big diffusers and cat-eye LED lights. It doesn’t look like anything else in its universe, or ours. Climb inside, but test-drive that gymnastic move before you attempt to do it with any measure of grace. The 570S's scissor-style doors are great for drama; McLaren calls them "dihedral" doors, which sounds like a D&D die. The word doesn't explain how, precisely, you're supposed to get into the damn car without looking like a noob. Though engineers worked to make the entry points as open as possible, it's not easy to slip in and slide over the 570S' super-wide sills into the 2-seat cockpit. Jump that hurdle, and the McLaren’s cockpit fits snug and cozy, somewhere between a tailor-made suit and a superbike. Exceptionally spacious, it's not, but a Corvette should have this much room, or seats as supportive. There's even a small shelf behind passengers for an attache case full of $1,000 bills, or whatever they're typically exchanged for. 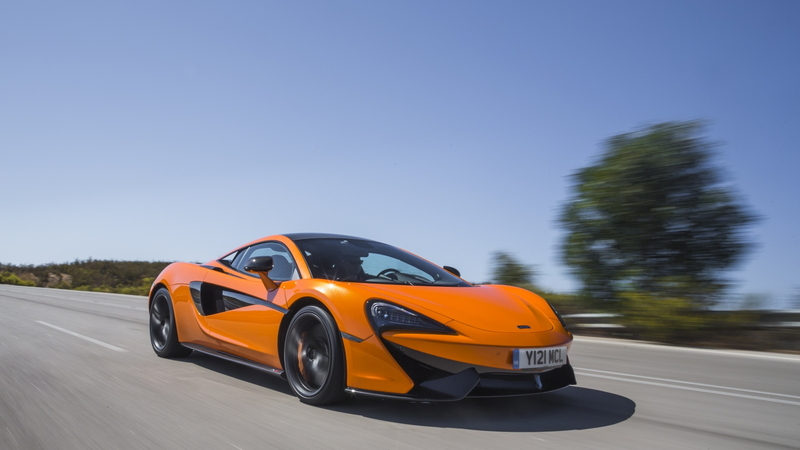 Flick the start button, and the 570S leaps to life, spooling up its turbos and running far above idle while everything warms itself up, including the digital displays. Colorful electronic gauges sit in a tiny pod and flame to life, while a much lower-resolution, portrait-style touchscreen eventually wakes up, on the center stack. If you squint, that center stack of controls looks a little like a face--an astonished face, anxious at what’s about to happen when you punch the start and drive buttons. The 570S seems to have been crafted around the singular idea of turning its passengers into passable clones for Dr. Strangelove's Major Kong, riding this explosive device straight to maximum velocity. It weighs only about 2,900 pounds, and that's with a bunch of things you'd never find in a truly stripped-down racing vehicle. Things like window switches, door skins. The heart of the car is a small but ruthlessly wound-up V-8. The 3.8-liter twin-turbo engine smacks out 562 horsepower and 443-pound-feet of torque from right behind your thorax, wolf-whistling its way up to operating temperature. The engine shares about 70 percent of its components with the Super Series cars, the 650S and 675 LT. Like them, it incorporates stop/start, and shockingly, this car isn't subjected to the gas-guzzler tax. It's raucous on full boil, but from a standstill the 570S could use less British reserve, more British naughty. The nippy V-8 back there sounds more like a twin-turbo six than a he-man muscle car, at least until you've spun it more than halfway to its 8,100-rpm redline. Then it shreds its vocals in humpy rockstar style--but it takes a while to get there. It's one of a few recent supercars (cough, NSX) that could stand to loosen up more, earlier. Coupled to its standard, sole 7-speed dual-clutch gearbox, the 570 can snap off 0-60 mph runs in about 3.1 seconds, and rattle the windows at a claimed 204 mph. The latter's impossible to measure on this collection of poorly paved straights and too-tight corkscrews. You want to know what it's like to drive a McLaren? Strap a Catherine wheel to the carbonite-frozen version of Han Solo, point him down any given two-lane, and give up all hope of catching up with him. Same. Thrust, brakes, and lateral grip, as well as an incredibly rewarding driver experience, have become road-going McLaren hallmarks. The 570S does not disappoint. The entire car's been developed to honor the lightweight, high-powered racing ideal. The monocoque and drivetrain huddle up in yin-yang harmony, with the engine mounted low, just ahead of the rear wheels, for 42:58 weight distribution. 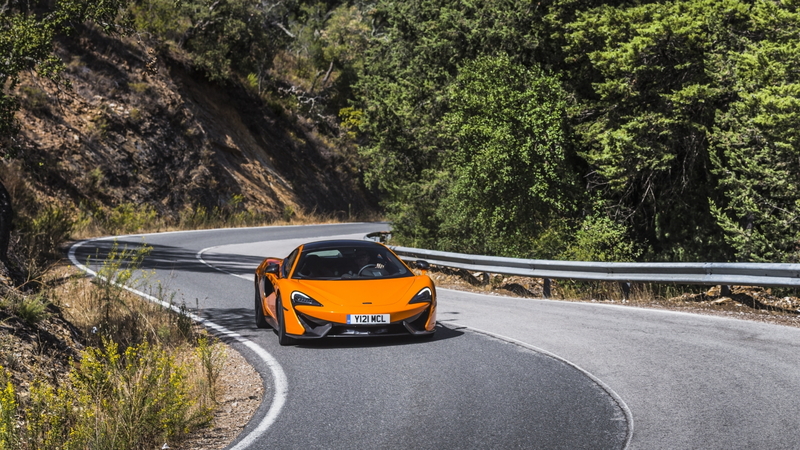 The thrust is undeniable, and so is the McLaren’s handling brilliance. You connect with it through communicative electrohydraulic steering, a set of adaptive dampers, staggered 19- and 20-inch wheels with Pirelli P Zero Corsa tires, and standard carbon-ceramic brakes. Almost everything toggles through a normal mode into progressively more thrilling sport and track modes. You can turn stability control completely off, for the days where track time’s available and affordable. It’s agile to a fault, even on dimpled and scabby roads like these. Rock the carbon-fiber shift paddles on their fulcrum, grip low on the flat-bottomed steering wheel, and the 570S turns into a scalpel. It's impossible not to be captivated by the way it rockets from apex to apex, steering in lockstep with what your brain is dictating, carbon-ceramic brakes demanding a fair amount of force but never failing to deliver sharp, steady pressure. This is one of the most focused cars of its kind, a bridge between the most exclusive sportscars and the most comprehensible supercars. It’s incredibly well-damped for a track-ready car, incredibly crisp and responsive for a high-buck sports car. It's an analog analogue to the Acura NSX's digital digitalis. It's a lean, paleo distillation of the hybrid P1, without all the green in its diet. And it's not quite so invisible as I thought. 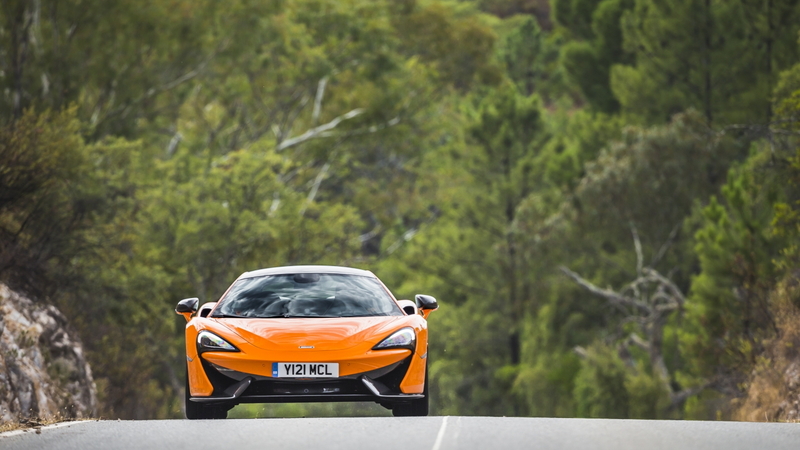 Tech titans with rich portfolios know exactly what the 570S, and what it's capable of. Say you're part of a crew of Tesla Roadster aficionados who convene every Saturday on Skyline. Fresh from a caffeine top-up at Philz, you blow past the office at Sand Hill Road and expect to be among the fastest, rarest things on the road. That is, until you spot an incandescent-orange British bottle rocket parked for a GoPro swap--and watch it blast off on a 3-second run to 60 mph and beyond. Lowest-priced, yes, just don’t call this the cheap McLaren. The base sticker is admittedly only $187,400, and actually includes all the good hardware. But, really, who among us would turn down $4,000 worth of brilliant orange paint? Or these luscious $3,700 5-spoke wheels? Or all the carbon-fiber trim, to the tune of almost $10,000? That's before you equip the 570S with other upgrades, such as Alcantara upholstery and Nappa leather, or bespoke interior treatments that coordinate paint color and cabin accents. Or before you exercise a little patience, and wait for the inevitable 570S Spider and its retractable roof panel. It's not confirmed, but seems....logical. The McLaren 570S is still a rara avis, without the instant recognition of a Ferrari, a Lambo, one of the more extravagant 911 Turbos, even the new Acura NSX. Those are cars that sell in the hundreds, and they're still magnitudes more familiar than the Scottish-accented supercar before you now. Maybe it should remain semi-secret. 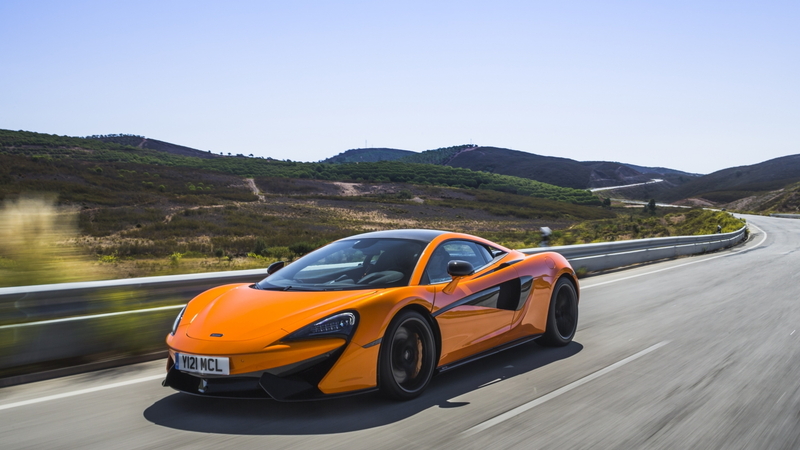 Most will miss out on the visceral Formula 1 feel of the McLaren 570S, but the lucky few will hang on to air of mystery that comes with driving the one of the least-known, best-pedigreed supercars of all.